DUESSELDORF, Germany -- Wladimir Klitschko stopped French challenger Jean-Marc Mormeck in the fourth round of a one-sided fight to retain the WBA and IBF heavyweight titles Saturday night. Heavyweight world boxing champion Wladimir Klitschko of Ukraine, left, celebrates after knocking out knock Jean-Marc Mormeck of France, right, in the fourth round of their WBA, IBF, WBO and IBO title bout in Duesseldorf, Germany, Saturday, March 3, 2012. The Ukrainian put down Mormeck with a left-right combination, followed by a short left. Mormeck beat the count but looked wobbly and referee Luis Pabon stopped the fight. "His strategy was to make me tired, but I dominated," Klitschko said. Klitschko was credited with the 50th KO of his career, but Mormeck said he could have fought on. "I was frustrated, I could have continued," Mormeck said. 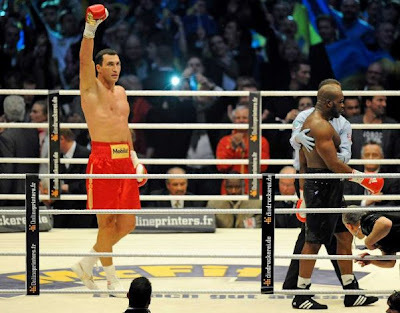 Klitschko floored Mormeck in the second and completely dominated the much smaller challenger. Mormeck never connected with a clean punch, although Klitschko said he had been hit with one jab. "My eye is still stinging," Klitschko said. Klitschko improved to 57-3, while Mormeck dropped to 36-5. Klitschko also held on to the minor IBO and WBO belts. Mormeck kept trying to come in, lunging forward with his head low and gloves high, often clinging to Klitschko. A former cruiserweight, Mormeck gave up 6 1/2 inches in height 7 inches in reach to the champion. Klitschko sent Mormeck down with a big right midway into the second round and it was soon clear he was looking to end the fight early. Both fighters went sprawling down in the third as they pushed and shoved. Klitschko picked up the pace in the fourth and connected with his left jab before flooring the Frenchman again. "I've been around for 15 years and now I have the 50th (KO)," Klitschko told the crowd at Duesseldorf's football stadium. "It's a big day for me." The fight had been originally scheduled for December, but was postponed when Klitschko needed surgery to remove kidney stones. French movie stars Jean-Paul Belmondo and Jean Reno were on hand to watch their countryman. Klitschko's older brother, Vitali, unanimously outpointed British challenger Dereck Chisora in Munich two weeks ago to retain his WBC belt and said he was hoping his next fight would be against David Haye, the British boxer who lost to Wladimir in July and is officially retired. Before the fight, Haye challenged Vitali again over a video link. "I hope the next fight will be against Haye," Vitali said in the ring.